Note: This solution is for Windows users only - Sorry Mac uses. Linux users you should already know what you’re doing! With the recent release of the Unity Humble Bundle, a lot of uses have found themselves left with a very full hard drive, whist others have been completely unable to download some of the chunkier audio assets due to a lack of C: Drive space. In a nutshell, Unity uses a hidden file on your C: Drive to save the assets that you download from the store. Once downloaded, you can then import them into any project you like without having to re-download it every time. This reduces the traffic on their servers and also makes things a lot quicker for you - especially if your internet connection is a bit on the slow side. Now, is this the best solution? Probably not. It would be nice if you could specify your own save location for these downloads. But, it’s been years since this problem was brought to their attention so it looks like we’re still stuck with it for now. The solution dear reader is symlinks, or Symbolic Links. This approach will allow you to point to a folder and that link will then appear to be the same to Windows. Think of them like advanced shortcuts. There are a few different types of Symlink available to you, including hard links and soft links, but to solve our Unity problem you’re going to want to use a directory junction. This is where things get fun! Follow the steps below and you should be set up in no time. If you can’t see your AppData folder, then go to “View > Hidden Items” to reveal it. It will look slightly fainter than the other folders in the list. This is just a precautionary measure, in case you want to revert back during the process. You can rename it to whatever you want but I’d just prefix it with an underscore for simplicity. Create a new folder at your desired location. This can be anywhere you like and called anything you want. I went with the folder structure “Unity Assets\Cache“ on my E: drive. Go to “Start > Cmd“ and right-click to run as administrator. If you’re successful then you will see a message that the junction has been created. If it fails then follow the advice in the error message. A common one is that the file cannot be created if it already exists. This means that there’s a folder in AppData with the same name that you’re trying to use. This is why we renamed the original in step 2. Note that the AppData folder must be named exactly as it was originally, that is “Asset Store-5.x“. If you name it anything different then Unity will not recognise the folder. Once this is all done you will notice the new folder in AppData will have a small return arrow on the folder icon, signifying that it is now a type of shortcut. If you open it then it will appear as if contents are within that folder by they are actually stored in the other folder you created. Now that the link is created, test it by opening up the asset store from within Unity. The program will quickly complain if something isn’t right but you may also want to try downloading a small asset to make sure that everything is connected up properly. You will see that the asset is downloaded to your new save location. It will also be visible in the folder within AppData but will not be taking up space on your C: drive. Now everything is working you want to clean up the last few things. First, you may want to copy over any assets from the original AppData folder to your new save location. This may throw up a couple of problems within Unity, but you should be fine. If not, just re-download them from the asset store. Finally, delete the original AppData folder that you renamed. This is no longer needed so you may as well get rid of it. Congratulations, if everything has gone according to plan you should have everything set up and working. Sit back, relax, and feel like a boss! Disclaimer: I bear no responsibility for any damages or loss of work caused whilst following these instructions. These instructions are presented “as is”, with every effort being made to ensure that the information contained is accurate and safe. Users should make appropriate backups before beginning the process and use this guide at their own risk. I wrote a few weeks ago that I’d submitted an asset to the store and it was just awaiting approval. Well that day finally arrived and my ‘CVD Filter‘ asset is now live on the Unity Asset Store. You can find it here (https://assetstore.unity.com/packages/vfx/shaders/fullscreen-camera-effects/cvd-filter-127303?aid=1100l3Ndu&utm_source=aff). It’s only a small asset but I’m really pleased to have it out there and I’m hoping that other developers will find it as useful as I have. I was watching the latest episode of Game Makers Toolkit (GMTK) the other day and they were covering the subject of game design in relation to color blindness. Feeling inspired I've gone ahead and created a new asset that allows developers to quickly switch between various post processing profiles that simulate the various forms of CVD (color vision deficiency). This has now been submitted to the Unity Asset Store for approval. Hopefully it'll be successful and go on to help many developers improve the readability of their in-game visuals for people that have CVD. EDIT: This asset has been approved and is now live on the Unity Asset Store. I mentioned last week that I'd decided to learn how to draw. Turns out, you just put pen to paper (or stylus to tablet in my case) and it just sort of happens. One thing I will say though it that it takes HOURS! I definitely have a renewed appreciation for the dedication that artists have towards their craft. There is so much to learn but practice really does make perfect. I took my wooden crate from before and gave it a hand painted look. The shading is pretty terrible and the wood-grain overpowers the piece (so I've been told by an actual artist). I took what I learned from my crate and paid a lot more attention to the blending and shading. I'm pretty happy with how this turned out for my second drawing. The cork is a bit too big for the bottle, but it was the last thing to be drawn/coloured and I was getting pretty tired. This was a fairly quick piece in the grand scheme of things. It was good to try doing wood-grain using a slightly different technique. Knowing the techniques to throw this together quickly will definitely make my UI work look better. I'm pretty pleased with this one too. I think the proportions turned out quite nice and it feels like a sword that has actually been used. So, that's all for now. This probably won't turn into a long term hobby but is definitely a good skill to have and will certainly make some of my prototypes look better going forward. Wait, before you tune out let me explain! Firstly, my last project is still in developement. I haven't just abandoned it. However, it is taking a bit of a back seat while I do some other work. Secondly, the reason for starting anther new project is because I'd quite like to strike whilst the iron is still hot! 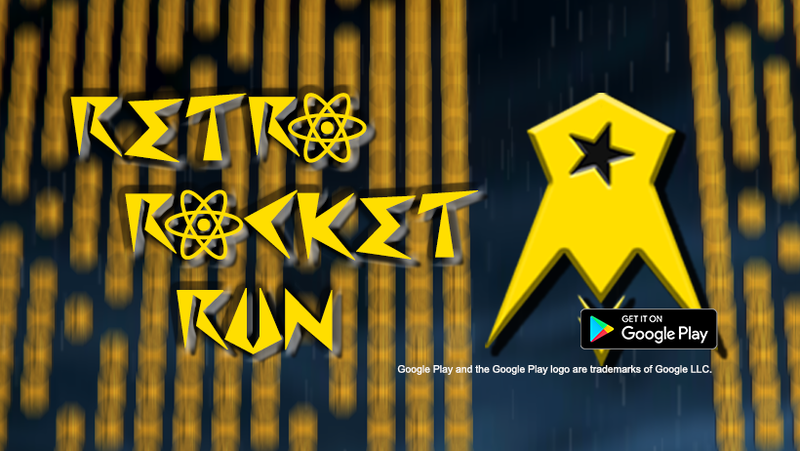 As many will know (if they stalk my general comings and going) I tool part in LD40 and made a game I'm really happy with (See Retro Rocket Run on the games page). However, it's not without it's flaws and there is still a lot I want to do with the concept. So, whilst there is still a little bit of hype in the air, I've decided to run with my original concepts and polish it up for a commercial release. This will probably be a few months away but I'd like to get it to a alpha/beta phase by the end of the LD voting period, so that the concept is still fresh in peoples mind. I've already made a strong start with fixing up some of the major performance that plagued the LD prototype so hopefully the rest of development will be just as smooth. Watch this space of regular progress updates and please let me know if you'd like to be involved in the beta. So first up, some news on the RPG. It's been slow. REALLY slow. I've got a maths exam coming up soon and have also been studying for the Unity certified exam, so I haven't really had much time for working on Blackwood. However, I did start a new course on game design, more specifically around board game design. In just two days I've put together a reasonably good strategy game and am in the process of looking for some playtesters to help me with tuning. The game is (currently) called "Carnyx" and is a game were you try to outmaneuver your opponent in an attempt to wipe their pieces off the board. The theme is loosely based on the Romans fighting against the Gauls (hence the two different types of coin). This is also where the name comes from (a Carnyx is an instrument the Gauls would play in battle). If you're interested, the rules can be found here. If you're really interested and want to get involved in playtesting then drop me an email or contact me on social media. For you're viewing pleasure, here are a couple of screenshots of the prototype I made in Tabletopia. Today was all about combat, which is coming along nicely. No animations yet, but the player can use a melee attack on enemies and they can shoot the player at range. This combat is pretty rough and ready, so will be changed before too long. Probably when I start looking at weapons and equipment. In the image below the red sphere represents the enemies attack radius and the blue sphere is their chase distance. If an enemy is chasing the player and the player moves outside the blue chase radius the enemy will return to their starting post. This is great for testing, although I'm thinking this behaviour will be a lot more complex by the time the final prototype is finish.